Wishing everyone a Merry Christmas and Happy holidays. 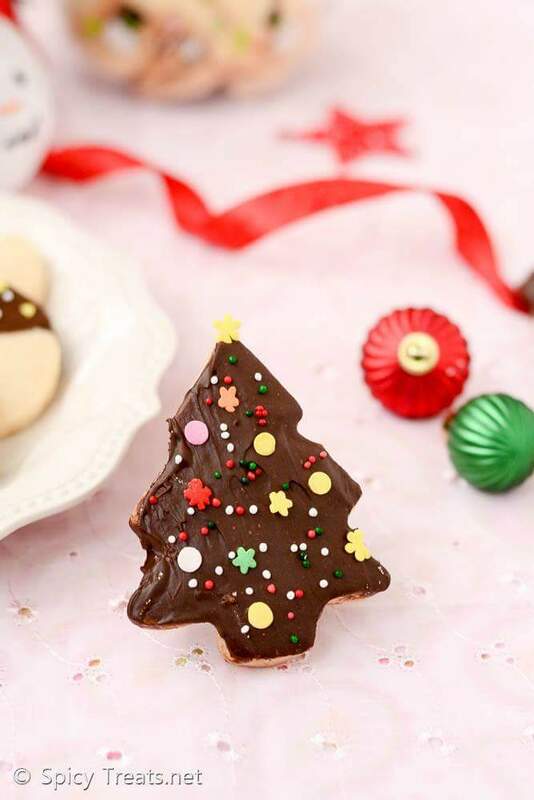 Today I am sharing an easy and simple cookies recipe that you can make for this Christmas and share it with your family and friends. 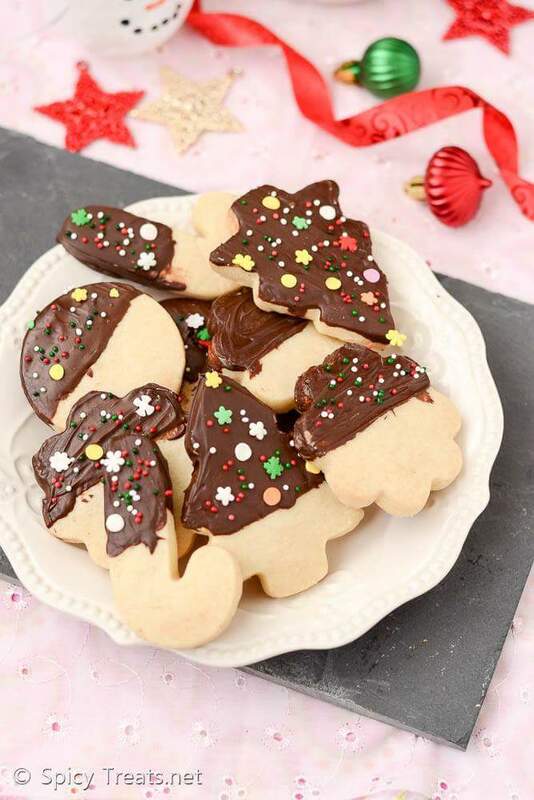 These shortbread cookies are even perfect to pack as edible gifts to your loved ones. I make this shortbread cookies every year and this pictures were all taken during 2015 Christmas. Luckily, i found these pictures in my draft last week and happy that I could share at least a single recipe for this Christmas. Beat butter and sugar together until they turns light and fluffy. Add in the vanilla extract, beat for few minutes. Now add the flour, salt and mix well to form a smooth dough. Then wrap the dough using a plastic wrap and refrigerate for 20- 30 minutes. After chilling, Roll the dough between two parchment paper and flatten it to 1/2 inch thick. 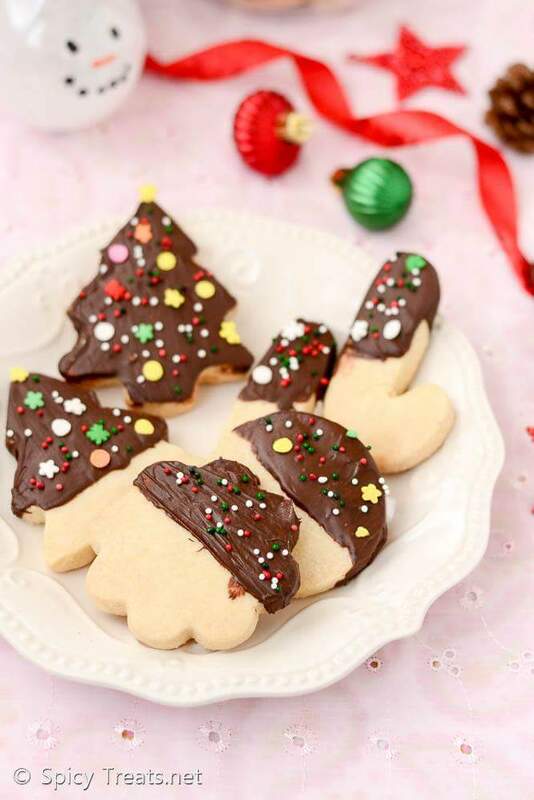 Using a Christmas or Holiday themed cookie cutter, cut the cookies from the rolled dough. Transfer the shaped cookies to a baking sheet lined with a parchment paper. Bake the cookies in the preheated oven for 18-20 minutes or until set. 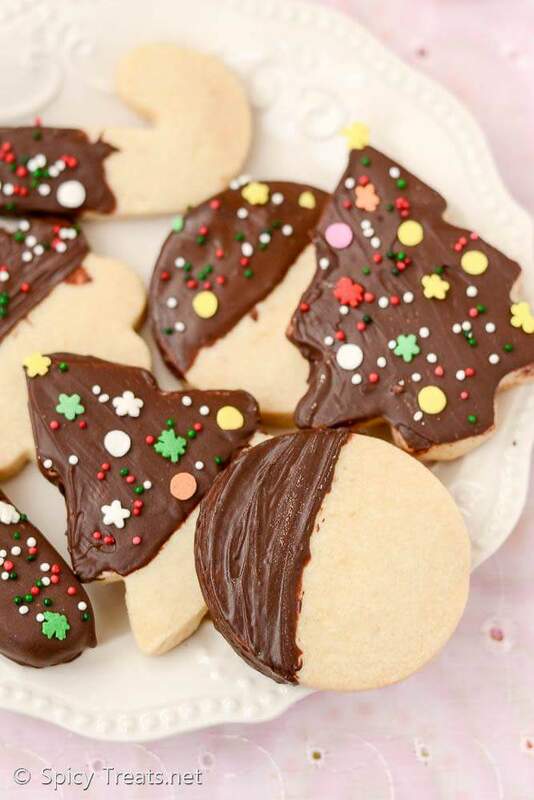 Cool the cookies on baking sheets lined with parchment paper.When the cookies are cooling, take 1/2 cup of chocolate chips in a glass bowl and microwave on high power for 30 seconds. Stir with a wooden spoon or spatula. Continue to heat and stir in 30-second increments until the chocolate is just melted. Add the remaining chocolate and allow it to sit at room temperature, vigorous stirring helps to get smooth and glossier. After that dip 1/2 of each cookie with just enough chocolate to coat it. adding milk is optional, i felt the dough was bit crumbly and not binding so i added milk. If using processor then the mixing is done better than by hand, so adding milk is optional and add only if needed. Freezing dough is must or refrigerate for 35 minutes. Use cold butter and cut into thinly slices or small pieces makes the job easier. 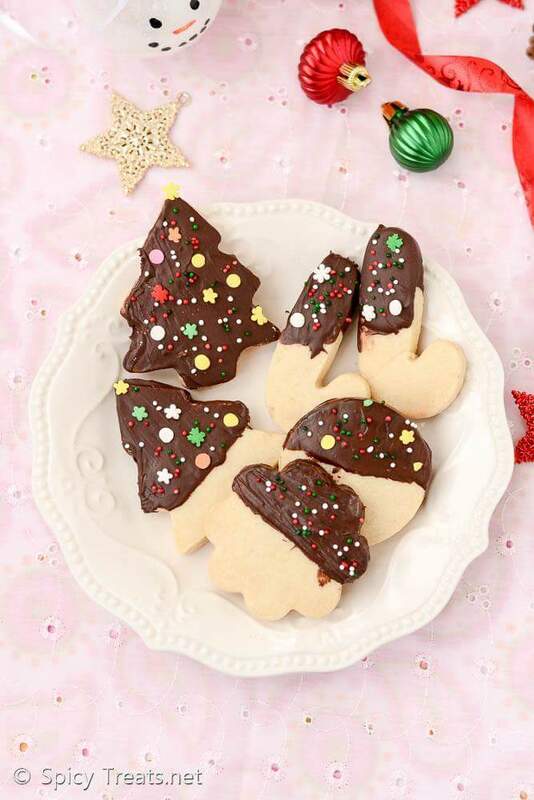 These shortbread bites are mild sweet and are perfect with chocolate dipping & sprinkles. I even used dark chocolate. You can melt the chocolate in microwave or double boiling method too.